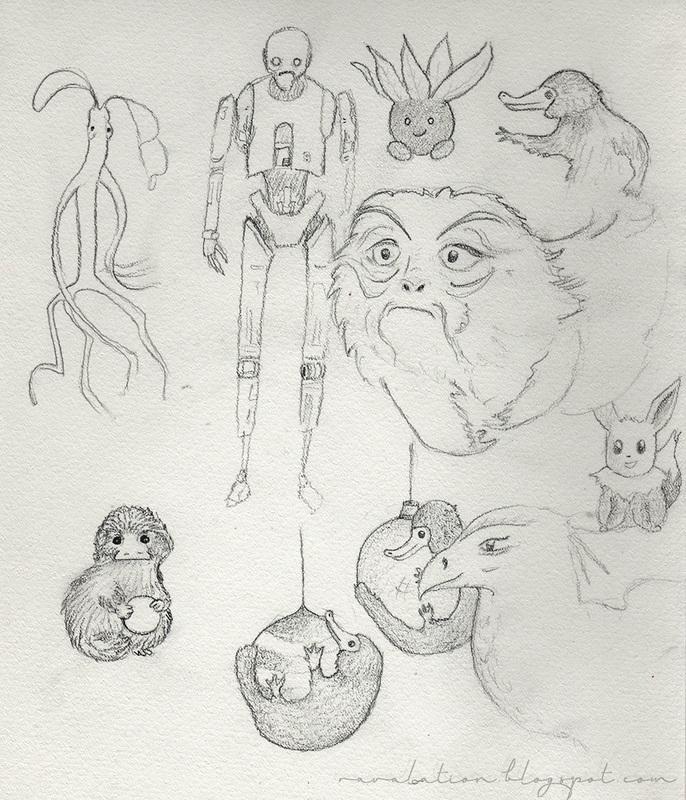 Find them all: the demiguise, flareon, K2-SO, thunderbird, bowtruckle, oddish and niffler (4x; can you tell I like nifflers?!). However, these were just lose sketches, so I tried to make combine them into a card design. First thought: very cute! Second thought: maybe a bit too cute? Third thought: this would've been perfect for Christmas, but it wouldn't arrive in time. Final thought: there's too much white around the "2017" in the middle. It could do with a better text. But what text would fit on a nerdy new year's card? 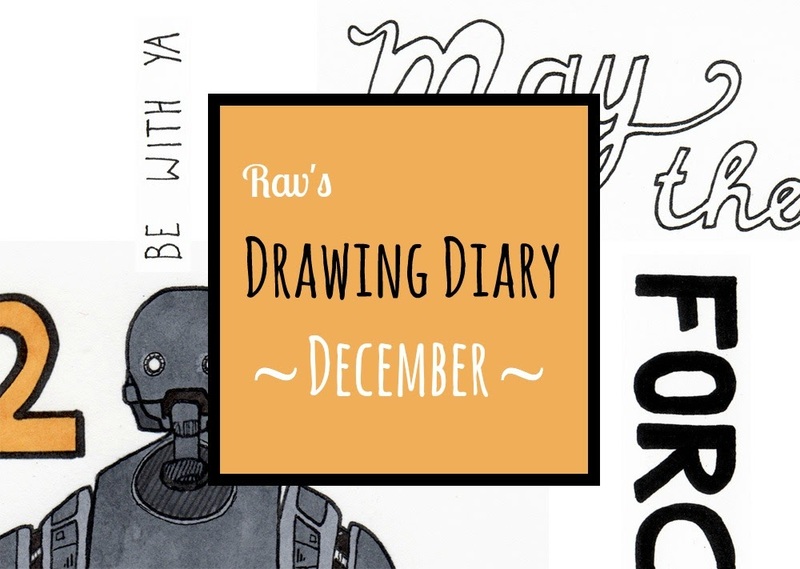 I made some scribbles and ended up liking the Star Wars themed one most. The only problem was that it worked better as a rectangle rather than square, and the "2017" text was a bit bland. But I liked it, so I decided to throw all previous ideas out of the window and go for a purely text based card. 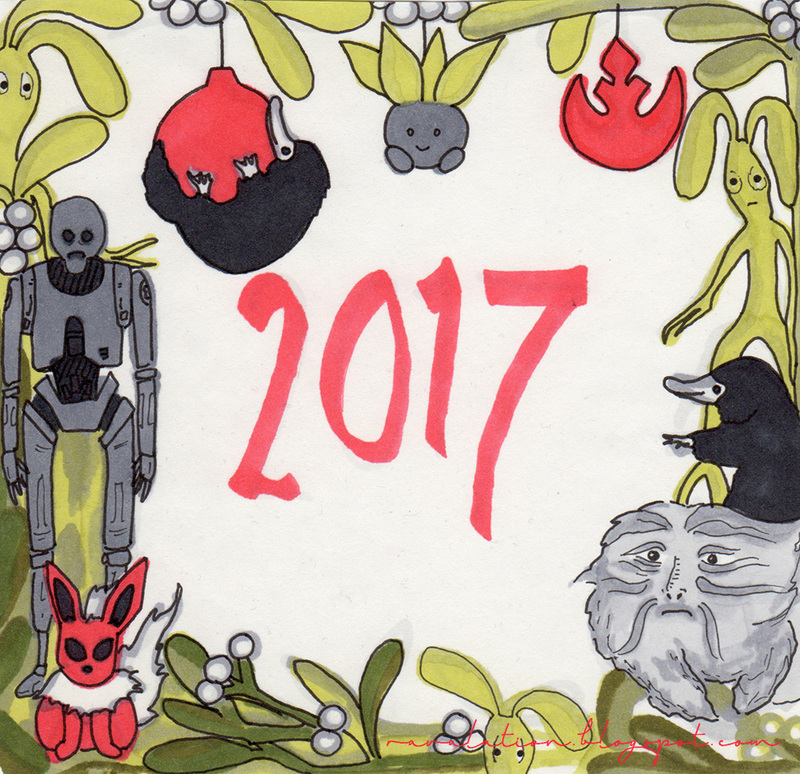 I just wanted to give it a bit more jazz by incorporating a drawing into the "2017". I ended up only sending K-2SO to people I was positive about they had seen Rogue One: I didn't want anyone ending up with a heart attack because of my card. 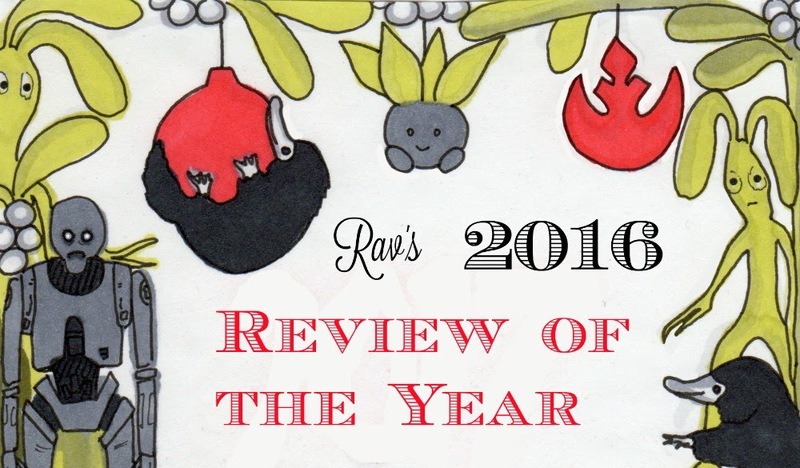 While I did not end up using anything from the first two sketches for my card, I created a header for my post Rav's review of the year 2016 with them, so the time wasn't entirely wasted. Finally, I want to thank everyone that participated in my card swap. I received so many cards that I almost feel guilty and selfish for setting this thing up! 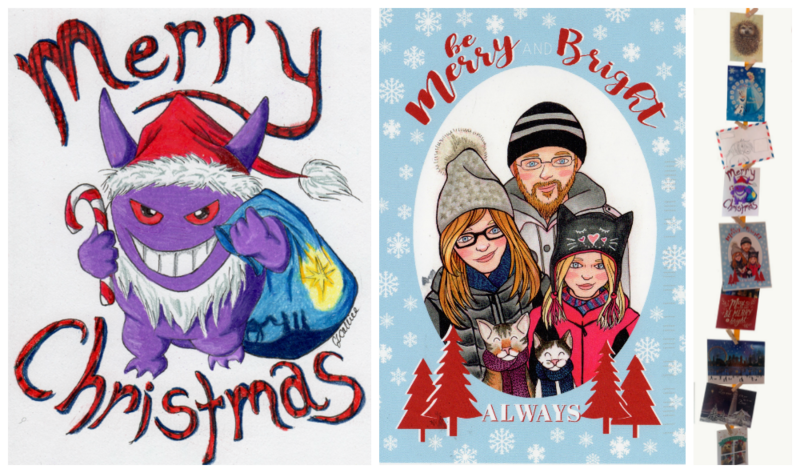 I received cards from readers that I didn't even know read my blog and some even sent really cool artistic creations. Just wow! I bought some ribbon and miniature clothespins and now they proudly hang on my wall (see below). I was actually feeling down in December, thinking gloomy things about the nature of people. But then all these cards came in from (semi) random people on the internet, and it was so awesome! So thank you, cool people that read my blog, for proving me wrong. 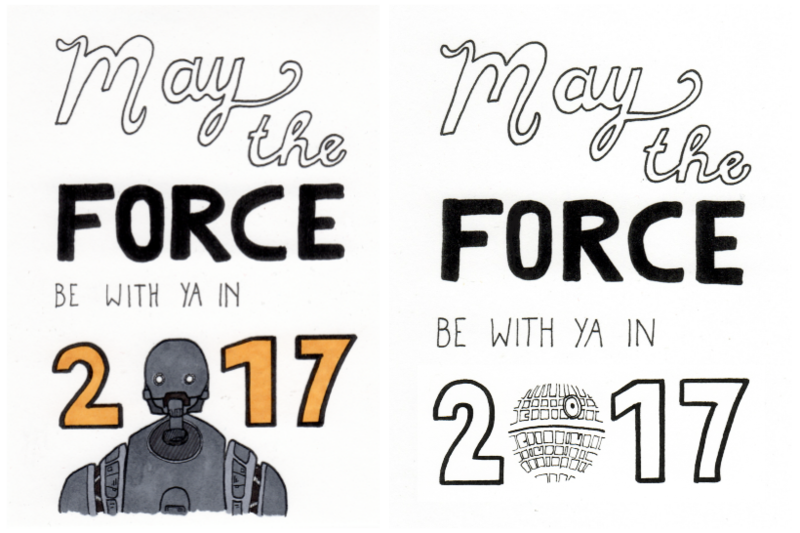 And of course: may the force be with you in 2017, always. Oh noes! I sent you another e-mail today. Check your spam folder, that might be where the previous one went. If you still didn't get it, send me an e-mail (see About me) so we can check the address. 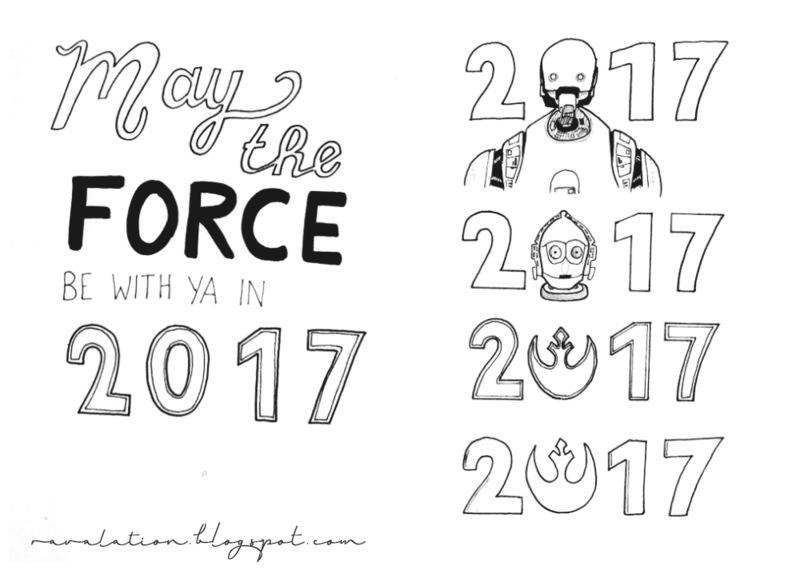 May the FORCE be with ya in 2017." My wife and I didn't realise, until now, that you designed the card, which makes it doubly precious. Again, many thanks from the snows of Idaho. And 'May the FORCE be with ya in 2017'. I'm flattered you didn't see right away that it was just me trying to write really neatly on the front of the card! It's never quite perfect, but that's one of the things I like about not doing things digitally. Your story about the speaker made me chuckle. I hope it will send good vibes your way (and I'm still jealous at the snow, haha). I love hearing how you came up with your card designs. I'll admit that I didn't sign up for the card swap until I had an idea of what I wanted to draw. Just in case I couldn't come up with anything. ^^; I am really glad that I did sign up. I had fun working on the card. I am so glad that you liked it! December was a rough month for me too. The middle of the month marked the twentieth year since Cocoa came home to be my true love of horses and this was my first Christmas without him. I'm so glad that you got cards that cheered you up! I hope you do the card swap again this year. I would love to participate again. Christmas is so tough for so many people. It's all supposed to be about family time, but as you grow older, you inevitably think of the people that are missing. I wrote a blog post about this but deleted it, because it was just too depressing. For me it was the first Christmas without my father and it was a struggle to find a way to make it work. Thanks again for the card, Rav! Confession: I had to google niffler to see what they are. I believe that I am one of the few people left in the world who's yet to see Fantastic Beasts - but anyhow your card for 2017 is very cute and nerdy. I definitely prefer the one with the deathstar...and I love the whole nullify theory - it's as if it's removing 2016's ability to affect us in any way. If this makes any sense at all...as for the annual card swap, I'm insanely jealous of everyone's artistic ability. I really admire the notion of the card-swap initiative; both the idea itself and the execution in general (I absolutely love the K-2 card!) are fantastic. It's just unfortunate for me that it's something I can't really 'get involved' with, since explaining why a stranger in Holland knows my home address (and why/how I know theirs) would be really difficult to explain away to my family. The burdens of not being able to have your own accommodation, I guess.